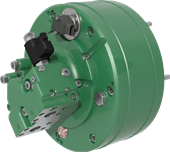 Variable Displacement motors are the most efficient method of transmission of hydraulic to mechanical power. They are available in five cylinder BV format and seven cylinder TV format covering a wide range of displacements, all with electronic control. The motors are able to vary displacement from any displacement from minimum to maximum. 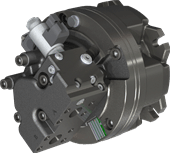 Due to the variation of displacement being by altering the crankshaft stroke the motor retains it’s high efficiency even in very low displacements, unlike some other variable motor designs. Fill in your details below to receive more information on our products. 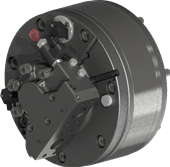 SAI BV Motors have five cylinders where the displacements can be varied between a minimum and maximum displacement giving very high levels of performance. 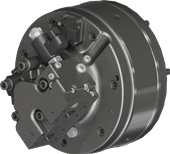 The displacement is changed electronically by altering the stroke of the crankshaft which enables high efficiency to be maintained in all displacements. 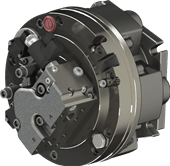 SAI TV Motors have seven cylinders where the displacements can be varied between a minimum (can be down to zero) and maximum displacement giving optimum levels of performance. SAI (GB) Limited has been successfully supplying hydraulic motors since 1993. The unique technology used in the transformation of hydraulic power to mechanical power, coupled with the experience and dedication of its staff, has cemented the SAI brand as a market leader.